I recently had the opportunity to attend the 2016 Project Management Institute (PMI) Northern Alberta Chapter Conference, where keynote speaker Jeff Tobe spoke about employee engagement driving business success. 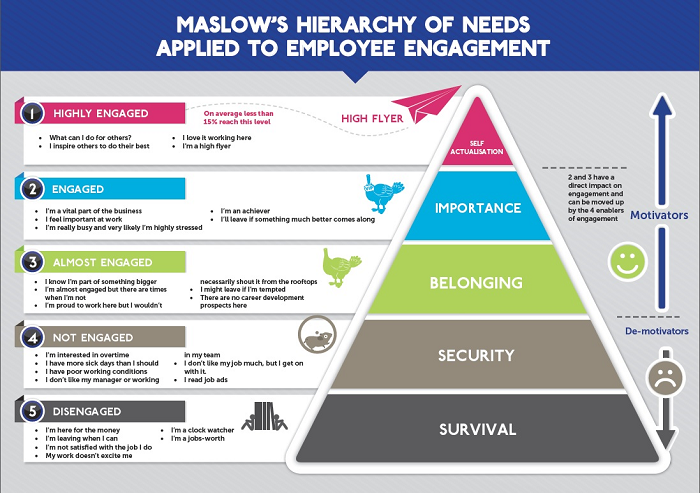 And interestingly, this handy re-visioning of Maslow’s Hierarchy of Needs, showing what engagement feels like, supports the premise that an engaged staff makes it easier for your company to deliver great customer experiences. This got me thinking about what we do at Adster Creative and how it translates into our own success. I see engagement present in Adster life, from account management processes, daily huddles, monthly meetings and team lunches, to the “Account Manager Weeklies”, “Throwback Thursdays” and the hallowed “Adster Feats of Strength!”. Creativity – Our unique and interesting ideas are welcomed in regular process reviews and updates. Accountability – Whether it be getting a blog post done, or working long hours on a tough project, we all take on the responsibility to get it done, while having the support of, and dialog with, the team. Vision – Dave and Andrew’s commitment to transparency regarding corporate direction, goals and metrics, helps focus the team on what needs to get done. Empowerment – Our team has both the knowledge & skills to get things done, and we know how to problem solve. Motivation – Between team lunches, sales bonuses and supporting our teams varied social hobbies, there is something for everyone. From the simple “thank you” to the occasional “highly recommending you have a Sunny” blog shout out! While not comprehensive, these pillars support Adster and fosters our ability to deliver some unbeatable customer experience! Proving that when you have an engaged crew, in the right place, the world wide web can be your oyster! We have a number of initiatives under way to measure our customer experience, our upcoming customer satisfaction survey as well as our ongoing monthly client reporting. These metrics help us assess our success from our customers perspective. By continuing to deliver on the five pillars above, and identifying additional pillars supporting employee engagement, I believe we will grow an even more effective customer focused team! I can’t wait! If you want to see our engaged team in action, make sure to come out to our Connect with Google™ Premier: Back to School & Back to Business event on September 21, 2016. Until then, if you’re looking to a get a head start on your fall marketing goals, contact Adster and see how we can help you get results.